The wires were free. It was in a box at a garage sale and the person asked "Are you sure you want that?" It looked like it started in some sort of order, there was a nice fold, a nice twist, but half of it was tangled. It became tangled worse. I had promised myself years ago that I'd straighten it all out but it was such a huge job. 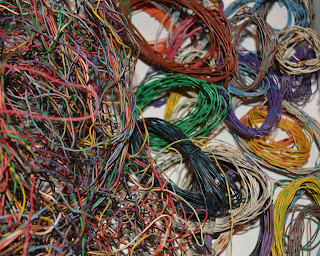 So instead as we needed bits of wire for projects, we found the colors we wanted, and pulled loose a long enough piece. Sometimes pulling from the middle and just cutting twice. Straightening it all out is like doing a jigsaw puzzle in reverse- in 3D. Finding an end, and untangling just that piece. Sometimes it's short. A few inches. Those are the smaller coils wrapped around a finger or two. Sometimes it's 5 yards or more. Carefully teasing the whole thing out, working it through the labyrinth turns. Even when it was a tangle, I could make pretty things from it. But once it's all straight, and I'll be able to see what's there, I'll be able to work with a plan. It just has to get all untangled and sorted. This bundle of wire life gave me. Each piece I pull free loosens up the rest, makes it easier to see what's going on in that tangle. When it's done,the things I make will be for me and my family, or they will be gifts. There is no way I can get what my time is worth in terms of money for this kind of labor. But I will value the pieces that I make with it. The brightly colored bangles and other things made with something that started as only waste that someone asked "Are you sure you want that?" And if I give a piece to a friend, it will be a friend who will value my time and thought. Life's lessons are where you find them. 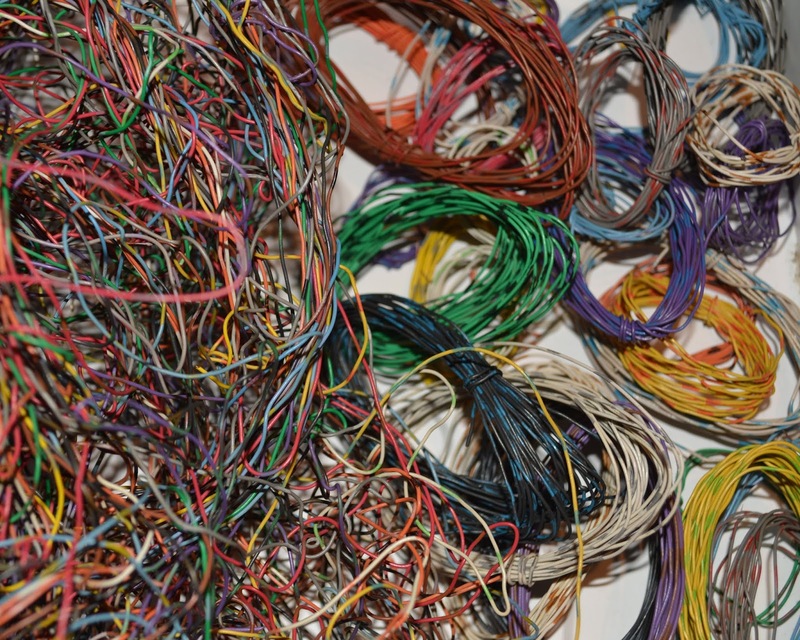 Today I'm finding them in the quiet unpuzzling of a tangle of wire.